I received Julep Nessa in my last Maven box, and when I first saw it in the email, I was immediately intrigued. It seemed so unique to me, and in real life, it is unique. 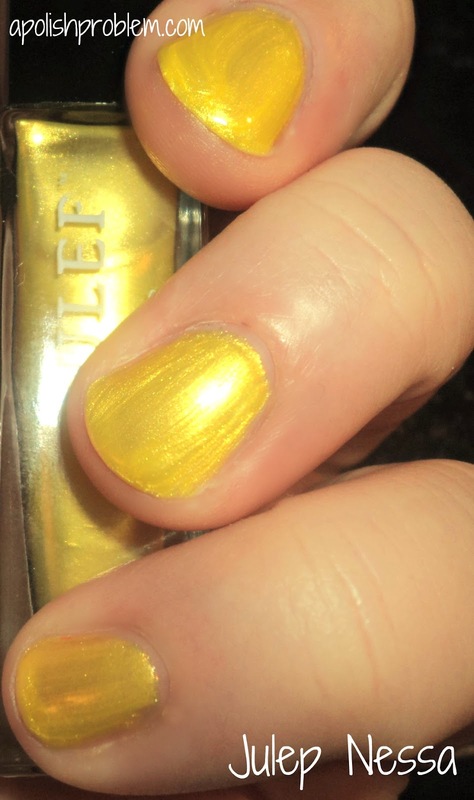 It's a daffodil-yellow, foil metallic, which is something that is not duplicated in my collection. However, as unique as it is, it is also as equally difficult to use. I wanted to really like this polish. I really did. The formula had a little issue with brushstrokes, but that's to be expected with this type of finish. The main issue I had with this polish was the brush. Given their short-ish hand and long stem, Julep brushes are naturally a little harder to use than a traditional brush. Unfortunately, the brush I had in my bottle of Nessa with more difficult than any Julep I've used to date. It flared out and was much like a mop. So I had a hard time applying to polish neatly on my nail and I also had an issue with drag. Perhaps I just had a wonky brush, though I have read a few other reviews of this polish, and see that several other girls had the same issue. I was able to reach opacity in 3 coats and if the brush wasn't so hard to use, I may be more positive about this one, because the color is really pretty, but application was just so crazy difficult that in my opinion, this one is a pass until Julep fixes the brush issue with this one. Julep polishes are available on their website, and also at Sephora, though this polish is not listed on Sephora.com. Juleps retail for $14. Julep Nessa was in my May Maven box. I do have a Maven referral link, but the above link does not link to my account. It is not an affiliate link. I love this color and I was so bummed when these boxes came out because I'd just cancelled my membership the month before. 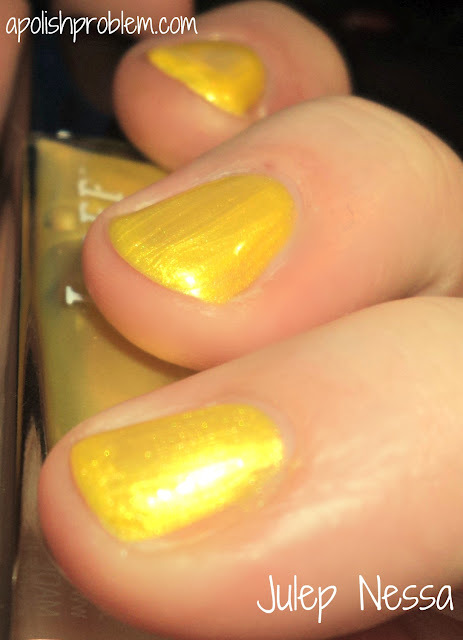 Most yellows look kind of bleahh to me, but this one is gorgie. And it's lovely on you. Sorry about the brush, though... it seems there were all sorts of issues with the It Girl boxes this time around. This would be a pretty color to use for nail art. I don't like polish that's hard to apply, but the color got me -- so bright and lovely! Stephanie, they did send some brushes in the following Maven box.